Having a long intro won’t describe the entire pain you will have to go through as you watch City of Ghosts. Beheaded bodies, bullets that mark the head of innocent people, children losing their lives, families that disappear within seconds is not the only thing you will be seeing along the road. The film tells the story of Raqqa Being Slaughtered Silently (RBSS), a group of brave citizen journalists who on a daily basis take unimaginably great risks to distribute the photos and videos of violent actions done by the ISIS. Having declared an informative war, the group has to run to Gaizentep, Turkey to continue their rebellion there. Some hid in undisclosed locations in Germany to fight against ISIS. Through archival footages, you will find beheaded bodies alongwith their heads put on display as a lesson for Raqqa’s people that the same will happen to them if they won’t be obedient. Hamoud, one of the activists says, “Camera is more powerful than a weapon.” By saying that, he is not just throwing words into thin air, but proves them in action while the videos that he took or pictures are being broadcasted all over international news. For five years you will find all brave activists continuing their fight against ISIS while the world turns a blind eye… all until ISIS turns their attention outside of Syria. It will be enough to watch a few graphic scenes to feel sick to the stomach. It’s unbelievable and shocking to see what was happening, and is still happening in Syria under some extreme rules of ISIS. Aziz says, to destroy ISIS, bombs or super-advanced weapons won’t help. The fight should begin, he continues, with the government which needs to put an effort to stop the massacre of its own people. But I guess what we learn from City of Ghosts is that the State is so powerless that its inability to take actions is stunning. 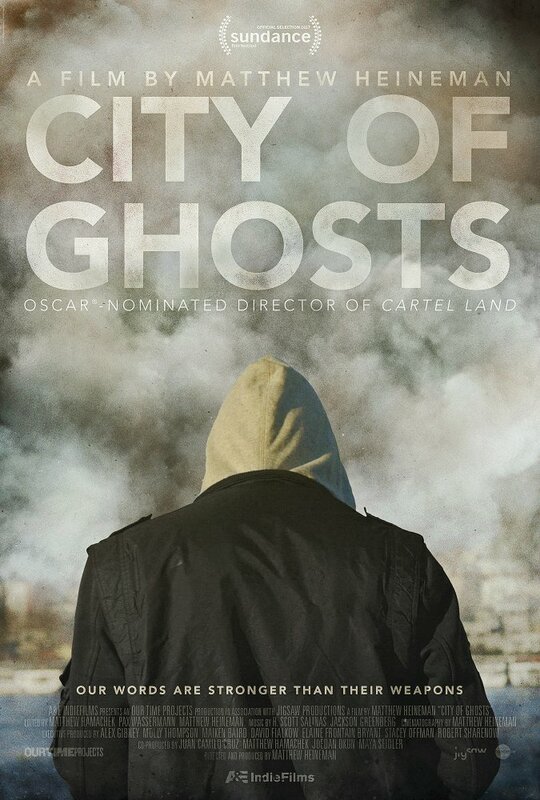 In conclusion, City of Ghosts is a powerful documentary movie that can be easily used as a definition of war in Syria. Every scene or speech will make you feel helpless. And I am sure many who were against Syrian refugees might change their mind as the struggle or nightmare they have to go through every day is nothing you might have seen or heard before. But trust me on that, if you never had a desire to stop the Earth to get off, after you watch it you will certainly like to….